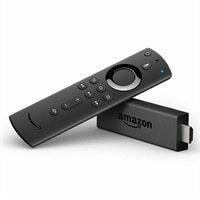 Amazon Fire TV Stick with all-new Alexa Voice Remote, streaming media playerJust plug Fire TV Stick into your HDTV and start streaming in minutes. With the Alexa Voice Remote, press and ask to easily find your favorite movies and TV episodes, plus live news and sports. All-new power and volume buttons give you more control. Stream must-see TV shows and movies, live news, and sports with the best-selling Fire TV Stick. Fire TV Stick is simple to set up. Just plug it into any TV’s HDMI port and wall outlet and then connect to Wi-Fi. Use the dedicated power, volume, and mute buttons on the all-new Alexa Voice Remote to control your TV, soundbar, and receiver. Enjoy over 500,000 movies and TV episodes. Watch favorites from Netflix, Prime Video, Hulu, YouTube, HBO, and more. Easily find favorites with universal voice search. Search across more than 200 popular channels and apps. Enjoy music from Amazon Music, Spotify, Pandora, iHeartRadio, and others. Take your TV with you. Bring popular shows and movies with you when you travel.